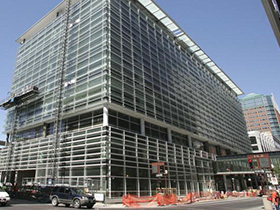 Marina Height Building C is a 237,000 square foot, six-story office building occupied by State Farm. This building will house the Human Resource Department along with training rooms. The interior tenant improvement includes high end pendant lighting, recessed LED Linear lighting combined with open area florescent troffers and includes lighting controls throughout. All six floors have a raised floor system. We installed over 500 in floor boxes at the raised floor level. BIM was utilized as well as ongoing cost analysis. The project included 183,000 square foot renovation of an existing three story building and included upgrading the central plant and generator. Project scope consisted of two UPS systems installed and grounding system for extra security. An elaborate, high end lighting system was complemented by artistic sound panels designed to reflect light and minimize noise in the massive space on each floor, as seen in the picture at right. In addition, the automated lighting system responded to motion and sound integrated through dual technology switches. Scope included site lighting under the parking canopies in the 160,000 square foot parking lot. "Wilson Electric played a major part in this projects success," said Don Scott of Sun State Builders. This design-build project included a building, garage and tenant build-out. It is 210,000 square feet and was finished in 11 months! 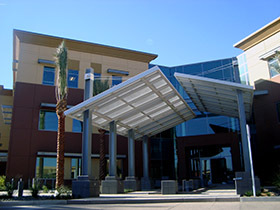 The building is a three-story tilt building which features EFIS accents and low-e bronze glass. Wilson Electric partnered with Sun State Builders and we look forward to working together again.